Kona coffee is considered one of the premium specialty coffees of the world. The cultivation of coffee requires a very specific combination of temperature, sun, soil, and water. It can be grown in only a limited number of locations on the planet. Where I live in Holualoa on the Big Island is one of them. 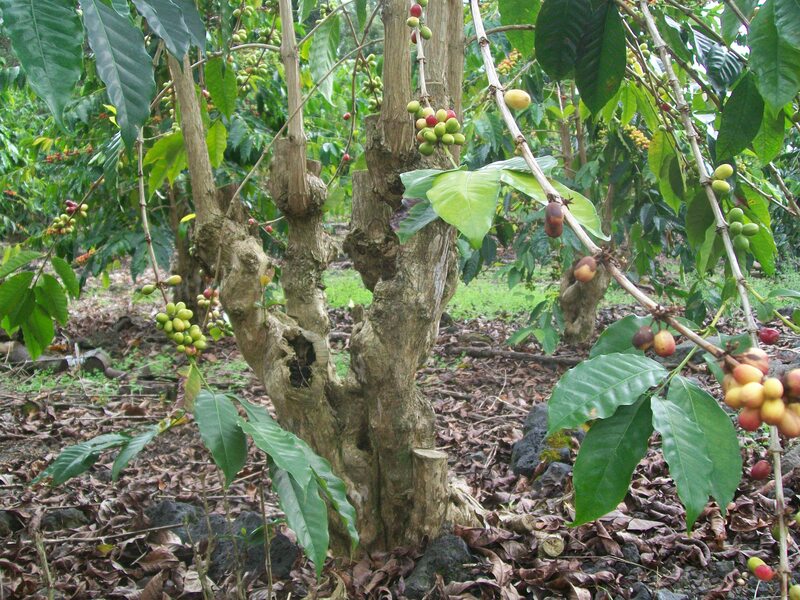 Kona Coffee (Coffea arabica, Var. 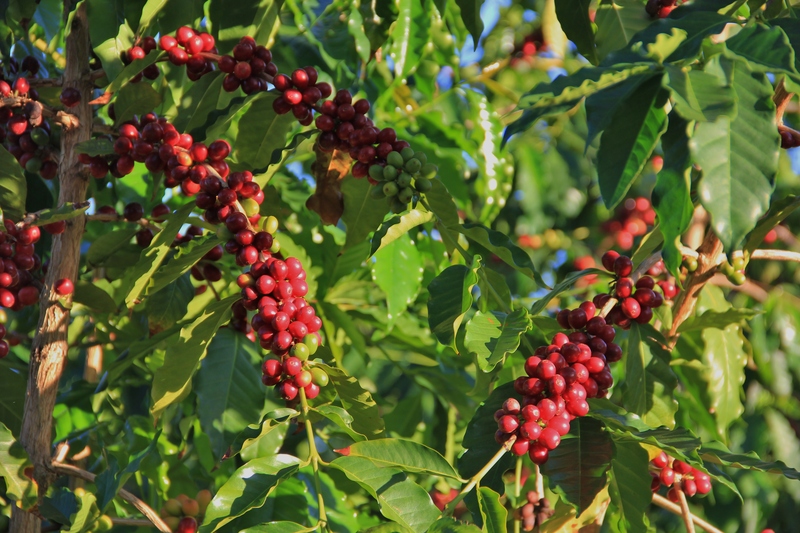 kona typica) legitimately only comes from the North or South Kona Districts of the Big Island of Hawai’i. 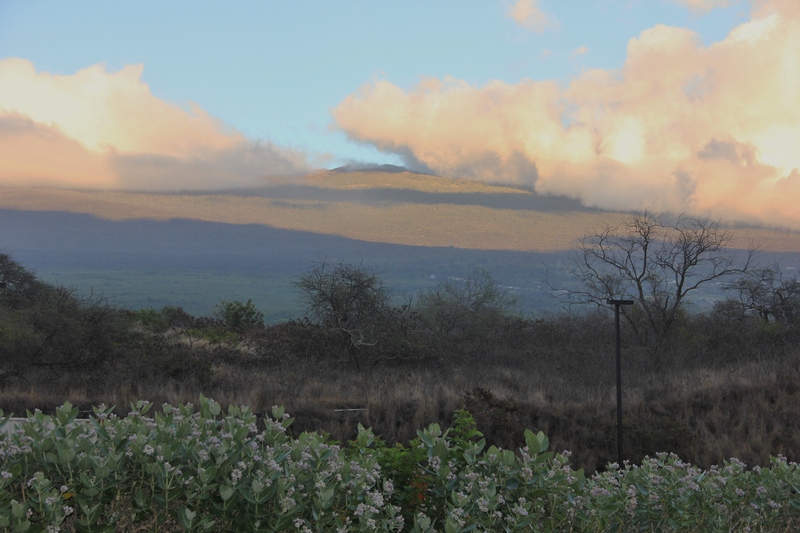 It is cultivated on the volcanic slopes of Hualalai and Mauna Loa. The weather pattern of sunny mornings, rainy afternoons, and mild nights create optimum coffee growing conditions for this specialty crop. 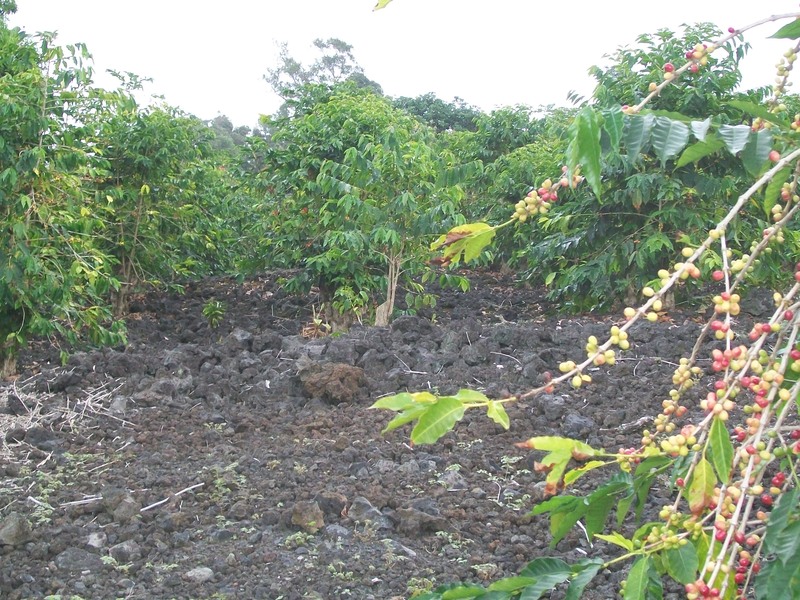 The coffee-growing area is tiny by world standards and occupies only a very small section of the larger Kona districts. It extends as a belt north to south for about 22 miles and is scarcely more than a mile wide. The coffee crop is cultivated between the altitudes of 800 and 2500 feet on steep volcanic mountain slopes. Below that it is too hot and dry and above is a rain forest which makes farming impracticable. Kona’s coffee belt has a similar climate to other coffee growing regions in the world in a way that the rest of Hawai’i does not. The coffee country faces the lingering western sun and unlike most of Hawai’i, the Kona district receives most of its rain only in the summer months. It is sheltered by mountains which block the northeasterly trade winds that effect the climate of the rest of the state. Clouds form in the afternoon bringing rain and an updrafted sea breeze cools the coffee during the worst heat of the summer days. The steep hillside of the Kona coffee land is formed from ancient lava flows. Only in the area of Holualoa where I live, has much mineral soil developed on the lava flows that date back to the last Ice Age. In most other places the coffee appears to be growing on bare lava. In actuality its roots are feeding on soil that has accumulated in cracks and voids in the rock. Reverend Samuel Ruggles an early missionary planted the fist coffee in Kona at his home garden above Kealakekua Bay in 1828 or 1829. 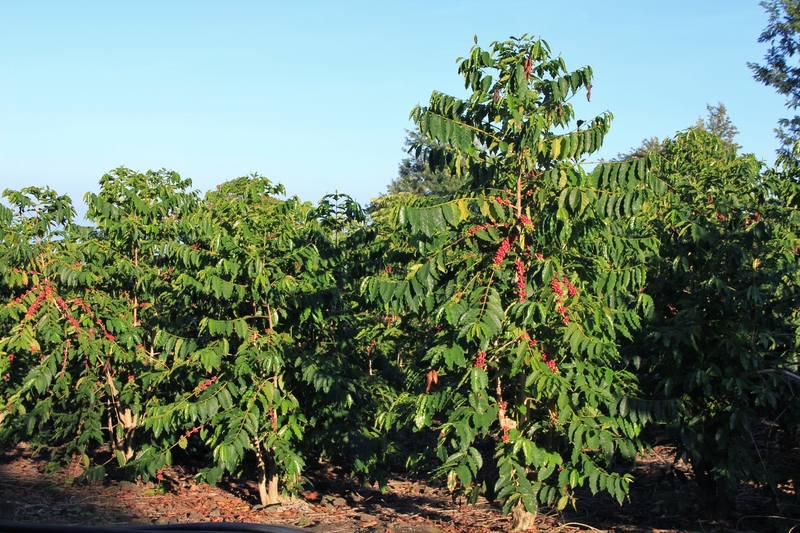 These first arabica coffee trees were taken from cuttings planted by Chief Boki on Oahu Island a few years earlier. Chief Boki, Governor of Oahu, had acquired coffee trees in Rio de Janeiro, on his way back from London in 1825. Initially, the trees were for decorative purposes and not planted for fruit production. 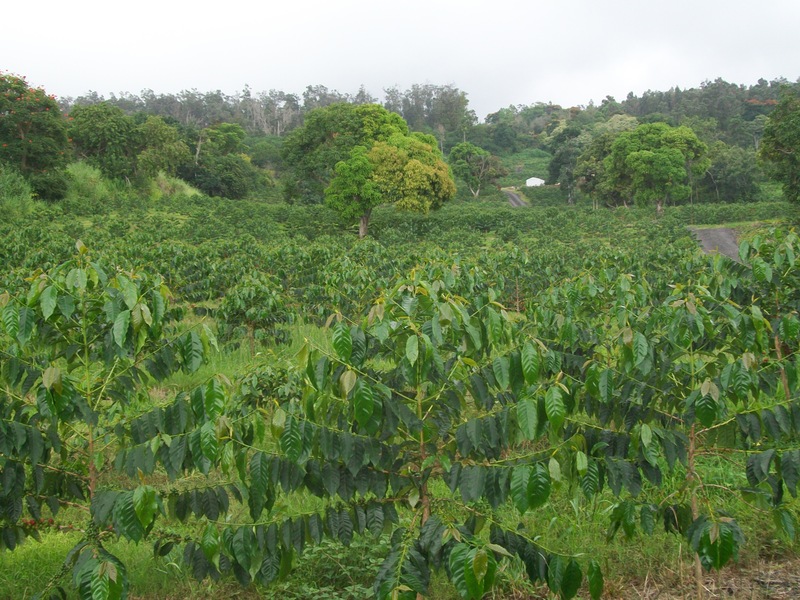 The cuttings took hold, the trees grew rapidly and within a few years others also began planting coffee above Kona. Later in that century coffee became an economic crop grown on large plantations. For a time the whaling industry was the primary purchaser and distributor to market Hawaiian coffee. When whaling finally faltered so too did the fledgling coffee entrepreneurs. Climate aside, early agricultural pursuits faced challenges. The steep rocky terrain is laborious to cultivate and labor shortages, drought, pest and disease infestations hindered growth of the industry. In the early 1890s the popularity of coffee as a preferred beverage rose as did the demand. The world market price for coffee climbed to unprecedented high levels. This attracted Americans and Europeans to invest in Hawai’i grown Kona coffee. 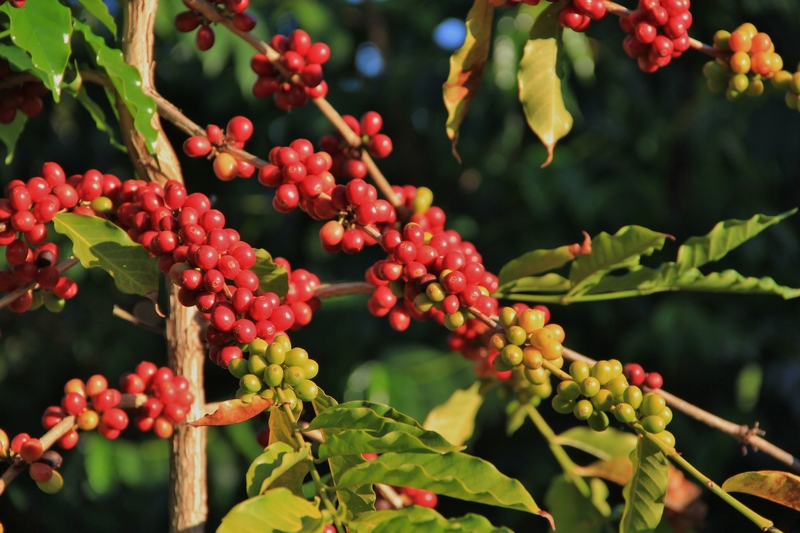 Kona experienced its first coffee boom and the development of large coffee plantations. At the end of that decade there was an oversupply of coffee on the world market and the market crashed. Prices plummeted and continued to steadily decline. By the early 1900s the Kona coffee industry was nearly extinct. When the world coffee market crashed in 1899, profits disappeared and plantation owners turned their attention and money elsewhere. 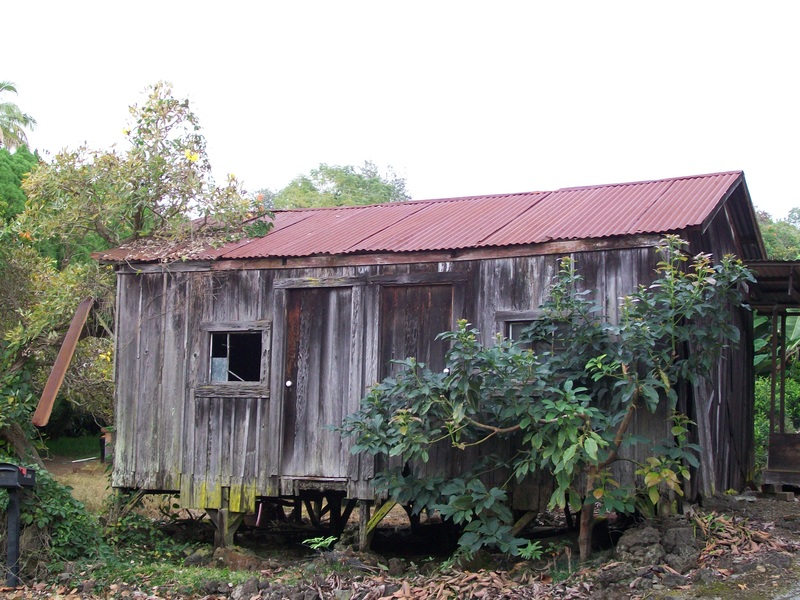 One coffee farmer, German immigrant W.W. Brunner, subdivided his large coffee plantation for lease to tenant farmers. Other plantation owners soon followed his lead, subdividing land into 5 to 15 acre parcels, leased primarily to laborers that had worked on the plantations. The coffee crop has for a century, come from these small family holdings. Working these tropical coffee fields on steep stoney hillsides has always been labor intensive. Everything – from planting to picking – is done by hand. Native Hawaiians and imported Chinese laborers were the first to work the large coffee plantations. Later, workers from Japan, originally brought in to tend and harvest sugar cane became the primary workforce during the 1880s and early 1890s. After the market crash when the plantations gave up and land was divided into small parcels, the Japanese immigrants began a legacy that still continues today. By 1910 the transition from plantation to small family ventures was complete. By then 80% of Kona’s coffee was grown by independent Japanese farmers and family run operations. Filipinos arrived to work the coffee farms about 1920, helping to pick coffee during the season and then returning to the sugar fields in the spring. 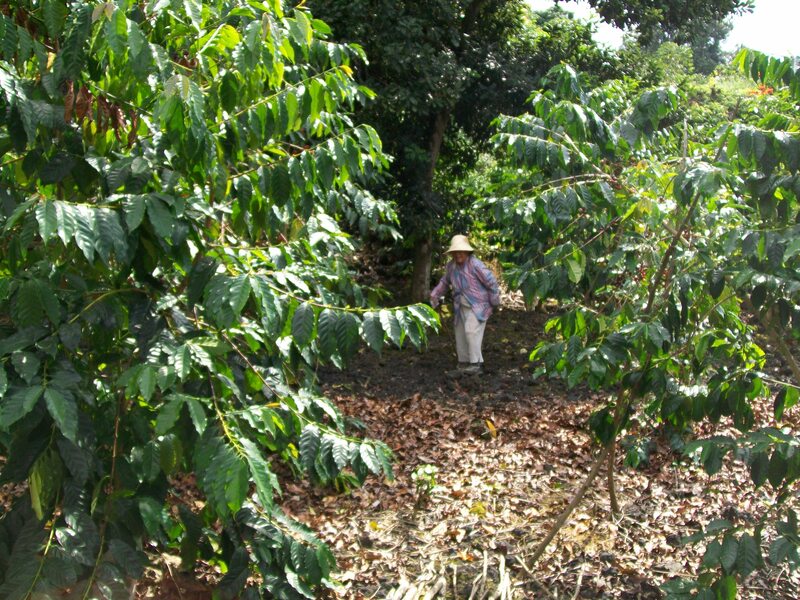 Over the years the Japanese farmers continued to work their small leased land parcels as family concerns, producing exceptional quality coffee crops. The transition from large coffee plantations to small family farms saved the Kona coffee industry but by 1981 only 1,600 acres of Kona’s hillsides remained in coffee production. Most of that was still small independent farms run by aging immigrant farmers and their families. Coffee and Kona has always been a perfect match. 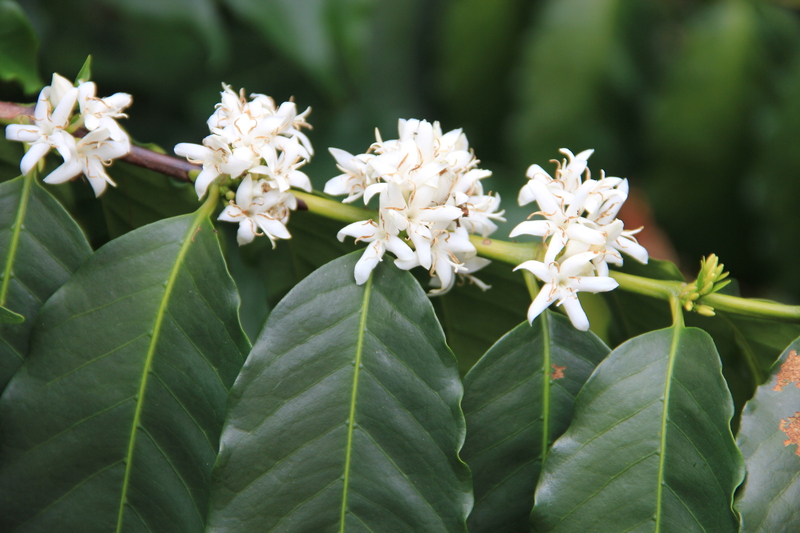 Kona coffee trees bloom in February and March and small white flowers, known as “Kona Snow”cover the acres of trees. For a few days the flowers emit a fragrant aroma over the fields reminiscent of citrus. In April, green berries begin to appear on the trees. By late August the green berries start to ripen, turning red. Because of the resemblance, the ripe red berries are called “cherry”. A tree will produce about 20 pounds of cherry. Each tree will be hand-picked several times between August and January as the berries ripen. It takes almost seven pounds of cherry to make one pound of roasted coffee. Within 24 hours of picking, the cherry is run through a pulper. The inner bean is separated from the pulp, and the beans are then placed in a fermentation tank overnight. After soaking for about 12 hours, the beans are rinsed and spread to dry on a drying deck. Traditionally the racks would have a rolling roof to cover the beans in the event of rain. Depending on the weather it takes 7-14 days for the beans to dry to an optimal moisture level of 10-13%. The beans are then stored as “pergamino” or parchment. The parchment, a thin papery shell is milled off the green bean just prior to roasting. 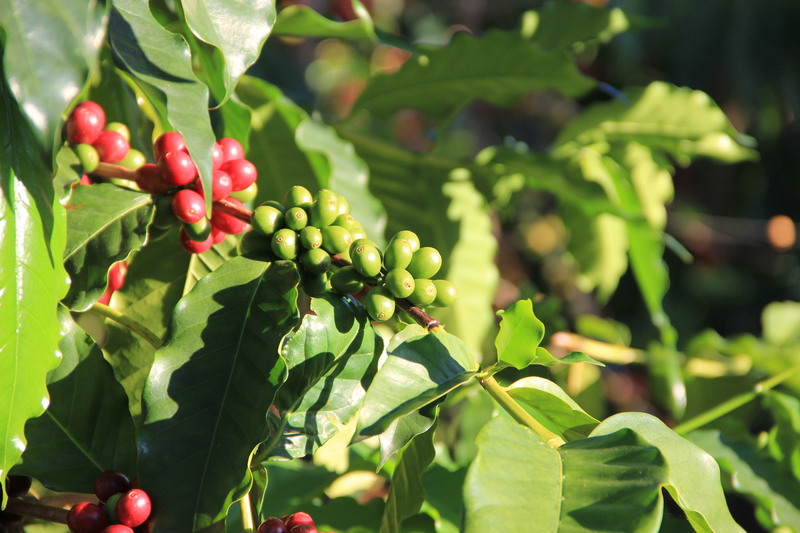 Coffee is still an important part of the local economy in Kona and there are now over 3,000 acres in production. Small farms are still the norm and many offer estate grown premium gourmet specialty coffee. The fine selection of limited production Kona coffees is recognized and awarded each year during the annual tasting competition at the Kona Coffee Cultural Festival. 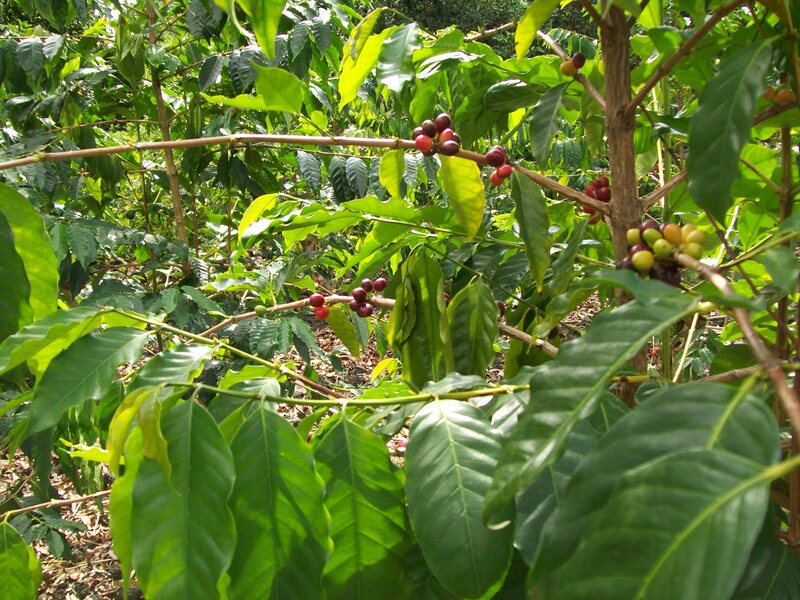 The market for 100% pure Kona coffee continues to flourish. The 186 year legacy of the Kona coffee pioneers is that Kona remains one of the oldest and most famous coffee producing regions of the world. Today many Kona farmers can lay claim to being fifth generation coffee farmers that continue a tradition and honor their heritage with every harvest. This entry was posted in environment, farms, food, history, local economy and tagged food, gardens, Hawaii, history, sustainable. Bookmark the permalink. Thanks for an extremely informative post, Dohn. I’ve just been looking at Kona coffee prices on the internet over here in the UK and, like you say, it is very expensive, which is a shame. Would you be offended if I stuck with tea for now? Alen, I live in the middle of it, surrounded by small coffee farms and I can’t afford the Good Kona for everyday. Aren’t there cheaper varieties of Kona coffee? Once in a while I get some from my wife’s cousin [she sends me coffee by ways of a subscription from a local coffee shop in Denver as birthday and Christmas presents] and they always have Kona coffee in one of their packages [in 1 out of 6]. I can’t imagine, though, that theirs would be that expensive. Very interesting to read about coffee plantations – some great photos to accompany the text too! I do enjoy coffee, and yet rarely think about where it has come from. Thanks Dohn!